There was a time when Reverend Moon himself would match men and women who had, through their commitment to this spiritual path, put their trust in God to work through him as the True Parent; he possessed extraordinary abilities in this area. However, as that method is no longer available to us, Unificationists seeking to find a match within the faith community, as is our tradition, can now avail of this introduction and matching service. It is presented as a seven-month ‘Heavenly Courtship’ under carefully developed guidelines that aim to ensure that those couples matched by this method will have a beautiful and lasting marriage, blessed by God. It is also designed to minimise the risk of hearts being hurt or broken – a tragic but commonly accepted feature of relationships in society around us. To have had at least one year of active membership before applying, including reaching out to others to share the message of the Divine Principle and promoting the values embodied in True Parents’ teachings. To have kept to a lifestyle of sexual purity for at least one year, ongoing. To have completed a course of study in the Divine Principle to Seven-Day level or more. To have offered tithing or made a financial contribution on a regular basis. To have demonstrated good character and enough maturity to be a responsible spouse with self-discipline and the ability to manage one’s own life (in terms of study, employment and being self-sufficient) as well as being ready to care for and live for the sake of others. Participation in a Blessing Preparation Workshop (this can be done after application process has begun). Being connected to a community of other Blessed Families. Filling out and submitting all the forms (a health check is required, as is a personal recommendation from an advocate). This is organised personally through Blessed Family Department staff who can liaise with their counterparts around the world. It is based on prayerful consideration of each candidate’s profile and personal history that have been submitted. A candidate should nominate an advocate, a person who knows them well and has their best interests at heart. The advocate will also be involved in the introduction process and communicating with BFD representatives. 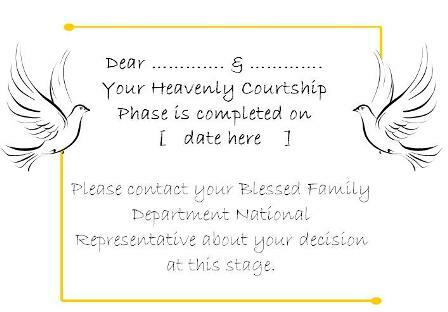 If the candidates agree to go further, they then are invited to begin a 25-Week ‘Heavenly Courtship’ Phase. 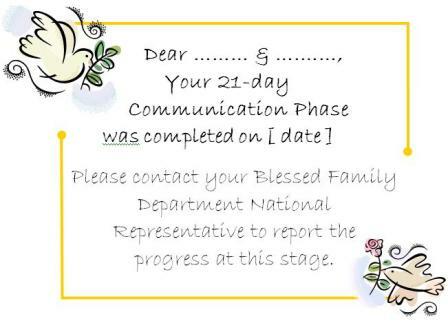 If, after the 21-Day Communication Phase, they do not feel to go ahead, they can simply say ‘no’ and return to the Matching Candidate group. In fact, at any stage in the Seven Months the couple can choose to say ‘no’. Having this opportunity is an important aspect of the process. Pray and meet each other, communicate more, visit each other as much as possible and get to know their engagement partner. Win the heart of their engagement partner. Pray and reflect to understand if they want to make an eternal commitment to build a Blessed Family together, cherishing their partner with deep devotion and care. Come to a joint decision to be totally committed in their faithfulness to one another in their Blessed Marriage, ‘forsaking all others’. Make an absolute commitment to raise any children they have in an environment of true love, following the traditions of a Central Blessed Family, centring on God and True Parents. Think about making their commitment to growing together as a beautiful and dignified Couple, and to take responsibility for any difficulties they might face along the way of restoration. The couple’s names, profiles and pictures will be presented to the Continental Director who represents True Parents. With this, the couple can feel that their match is offered to, and approved by, Heaven. They then begin to prepare for the Blessing. If they have not done so within the past two years, they should attend a Blessing Preparation Workshop and local BFD representatives will help to ensure that some suitable education is available. To attend as a couple would provide a good opportunity to develop the spiritual life they will share together. Then it will be the couple’s joy and privilege to attend the Blessing Ceremony. There they will receive the Holy Wine, the Holy Water Ceremony, the Benediction Prayer from True Parents and exchange wedding rings. Following the Blessing Ceremony the couple will carry out the Indemnity or ‘Chastening’ Ceremony, explanation of which is given at the time. Immediately after the Blessing they then enter a 40-Day Separation Period. This again has always been part of the blessing tradition, although for early couples the period was much longer. During this time, the couple still relate as brother and sister, demonstrating a desire to put God first in their relationship and ensure their love for one another has gone through a purification process through exercising such self-discipline. The fifth and final step of the blessing process comes at the conclusion of the forty-day separation where the couple participate in a ‘Heavenly Honeymoon’, the Three-Day Ceremony through which they can be restored as on original husband and wife and begin their conjugal relationship in a heavenly way. Again, the procedure and details of this will be explained nearer the time. With this the whole process of the Blessing is complete.